Welcome to the Douche Club, Tom Tancredo! If you've been watching the news this week, then you've heard about the ridiculous statements made by Colorado Republican Representative Tom Tancredo. If not, Mr. Tancredo put his foot in his mouth when he said, "Because we don't have a civics literacy test to vote, people who couldn't even spell vote, or say it in English, put a committed socialist ideologue in the White House named Barack Hussein Obama." Tancredo spoke at a February 4th National Convention for the Tea Party movement, at which he said the above statement and further called for 'civics literacy tests' to be put in place before people are allowed to vote. Civics literacy tests, for those who don't know, are what the US government used from the late 1800s until 1965 (with the passing of the Voting Rights Act of 1965) in order to keep immigrants and black people, specifically, from being allowed to vote. Would-be black voters were required to know everything about the federal government, and some information about state government operations. However, you might be surprised by some of the questions. In 1933 Franklin Delano Roosevelt proposed a series of government programs that became known as...? So... Would you pass a potential Civics Literacy test if you were required to do so? I'm fairly certain I'd have a hard time, and I'm pretty positive most politicians would as well. What do you think about Tom Tancredo's statements? The man has a history of saying stupid things to get attention, which is only natural as he's an insignificant Representative from an almost insignificant district in Colorado. Sounds like a case of short man syndrome to me. Sounds to me like he needs to take a few civics lessons himself. Not to mention a few lessons on being a decent person. I've lived in Colorado most of my life, I love Colorado, generally. But sometimes it is just embarrassing to the The-Church-Of-We-Will-Tell-You-If-It's-A-Family-Value in Colorado Springs and an idiot like Tancredo in Washington telling people he is from here. 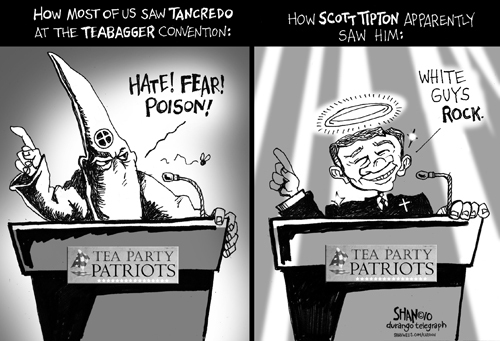 Fortunately he is an EX representative and only the tea party and the klan is interested in what he is selling. ARE interested ....why can't we edit comments?? ?